We’ve encountered several situations recently where it was required to acquire information from external systems that already had an API to expose data with web services. With data federation in SAP HANA SDI, we can make virtual tables, meaning that they can be manipulated or used like regular tables, but no data is actually stored. When a query references a virtual table, the data is sent by an agent connected to the source system. In the example below, we’ll make a virtual table of 5 columns that is populated at every query by the content coming from a web service. SAP HANA SDI SDK provides the ability implement any processing and formatting logic with an interface at the database level, making it seamless to embed in views, odata service or any HANA database artifact. As usual, the documentation is always a good starting place, as well as some previous blog posts. Here’s an example that for data source without copyright, a customer needed to fetch some financial information from company filings available publicly on the website of the SEC. There is a file called master index that is updated regularly. Instead of scripting a download, transformation and import of the file, we’ll make the content of the file available as a database table. 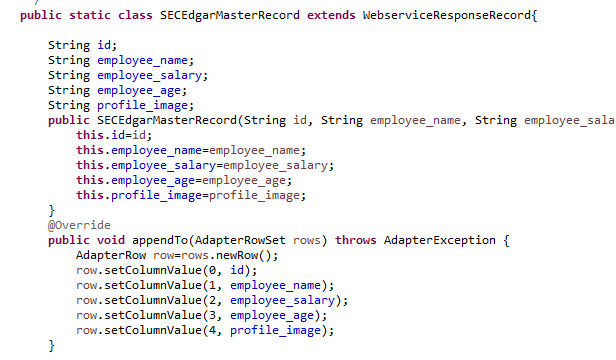 We implement the abstract class WebserviceConfig in SECEdgarMasterService. In this case, there is no input parameters, we simply define the webservice as a virtual table of 5 columns. We implement the abstract class WebserviceResponseHandler in SECEdgarMasterResponse. It consumes the output of the http request line by line. After skipping the header, it builds a list of records and returns it. The WebserviceAdapter class will then handle sending the records to SAP HANA in bulk. The inner class SECEdgarMasterRecord must implement the method “appendTo” that is called to send records to SAP HANA. And that’s it for coding ! 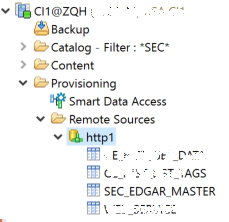 Then we build the adapter, deploy the jar at an exsiting data provisioning agent as a custom adapter, and register the adapter in SAP HANA. When browsing the remote source associated with the adapter, we can see 4 webservices exposed as virtual tables, including our example one. We then create a virtual table pointing to the SEC_EDGAR_MASTER table, and we can start to explore the content of the table. Fetching the first row of the virtual table takes 3 seconds, and fetching all 227 000 rows takes 3.2 seconds. After abstracting the low level methods into a few classes, developing database interface for web services was fairly easy. We present the data using only SAP HANA and a Data Provisioning Agent, no ETL, no scheduling and no flat file imports. In the future, I will likely post another adapter, a more advanced one using input parameters. We have Imported the webserviceAdapter into SDI Agent from GIThub and replaced with custom API URL and changed the column fields and datatypes. WebserviceAdapter has successfully deployed and created a remote source but we are not able to retrieve the data. Please help to us to how to debug the code and to receive data from custom API’s. You’ve customized the request, but did you customize the response as well ?